Get up to 90 percent more light on the road with GE NIGHTHAWK PLATINUM headlights compared to standard halogen headlights. GE's Brightest automotive halogen headlights improve visibility where you need it most - on the road. The innovative design combined with a platinum colored tip and blue skirted coating improve whiteness for better contrast while providing a high-end premium look. Drive with confidence. Drive with GE NIGHTHAWK PLATINUM headlights. Easy to install in minutes. 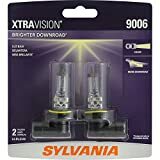 Replaces standard 9006 low beam or fog bulb. Just plug them in and go.